How to update your current position/avatar and to edit your information. Introduction to your own Activity Stream page. How to view profiles of your contacts, to send/revoke a connection request, to accept/deny connection requests and to disconnect from your contacts. Introduction to your private Wiki. Details of managing your dashboard, a list of gadgets used in eXo Platform via dashboard, how to change gadget preferences and to add external gadgets from dashboard. Details of which notification types you will receive. Your profile is always visible by all users of the portal that helps them understand more about you, so it is very necessary to have a profile with the full and clear information. 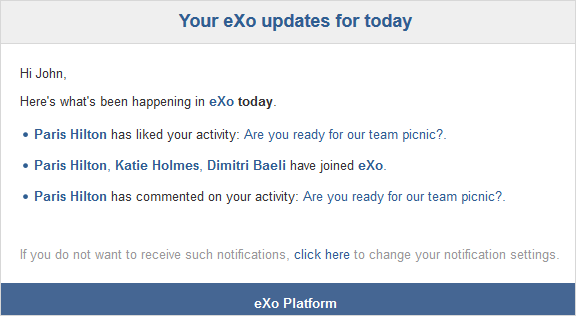 From eXo Platform 4.4, the profile page has been redesigned in order to enriche and better organize yout information. To access the My Profile page, simply click your display name on the top right corner, and select My Profile from the drop-down menu. red - “Do not disturb”. your Contact Information, such as email, gender. your Recent Activities that lists the latest activities concerning yourself or with which you reacted (comment, like). You can either click on each item of the list to jump to the corresponding activity stream with full information, or select View All button to go to the expanded list. your People that displays the most recent connections you have made. From the scratch, if you do not have anyone in your network, a message saying “You do not have connections yet.” will be displayed. By clicking Find connections, you will be redirected to the Search for contacts page. When you change the information of your profile at the first time, an activity will be created on the activity stream. Also, a comment informing your change is added to the activity. Your later changes will automatically create comments updated to the activity. In the Contact Information and Experience sections, click corresponding to one field which you want to add more or click to delete your input information. After making changes, click Save or Cancel to respectively save or ignore them. The followings are changeable information in each section. When accessing to your profile, a banner is displayed in the top of the page. By default it is grey. You can change it and select a profile image. Mouse over the top right of the grey banner, an icon will appearn and a tooltip indicating that the banner should have 130 pixels height. Click on the icon , an update button appears . Click on the Update button, a drive from your hard disk will open. Select the desired profile banner image and double click on it. The profile banner image will be automatically loaded. Update button which opens a drive from your hard disk and allows you to change your profile banner. Reset button to restore the default grey banner. Your avatar in a cercle form. Your display name and your chat status. The edit button allowing you to edit your profile. The More button which appears when applications display exceed the navigation bar limit. In mobile devices, when scrolling down your profile page, the applications navigation bar is scrollable left and right. A brief introduction of yourself with 1500 characters in maximum, telling people who you are and what you do. If this section is empty, it will not be displayed on your profile page. First Name The first name that should be from 1 to 45 characters, and contains letters and space only. Last Name The last name that should be from 1 to 45 characters, and contains letter and space only. You can also change the above information in the Account Profiles tab by clicking your display name, then select Settings from the drop-down menu. These changes will be automatically synchronized with details in the Contact information of your profile and vice versa. Avatar The representative picture of user. If it is not defined, the default avatar is used. Gender The gender of user. Select your gender from the select box, either male, female or empty. Phone The phone numbers at work, home or at other sites which must be from 3 to 20 numeric characters. IM The nickname of either IM services that must be between 3 to 60 characters. URL The website address which must be in the correct format, for example, http://exoplatform.com/. 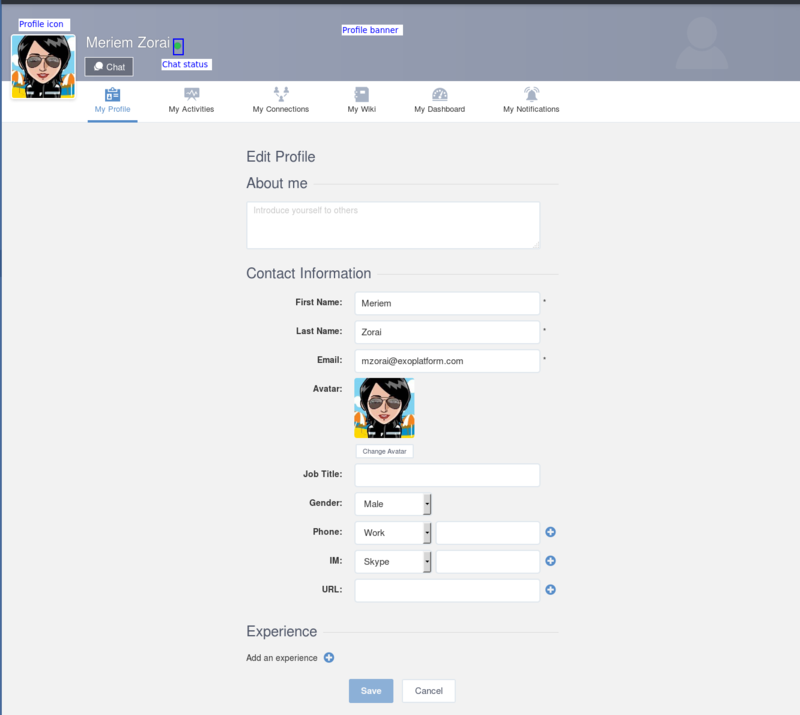 Click on button then on Change Avatar from the section Contact Information to open the Upload an Avatar form. Click Select File to pick up an image from your local device. Select your desired image, then click Open button, or double-click the image to upload. The uploaded image must be smaller than 2 MB. 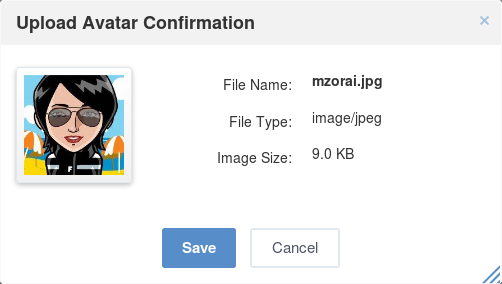 Click Confirm to open the Avatar Preview form to see some related information, such as file name, file type, and image size. Click Save to accept your changes. Mouse over your profile avatar, an icon will appear. Click on that icon, an Update button appears . Click on the Update button. This will prompt you to pick a file from your computer. Double click on the desired image. The profile icon will be automatically changed. This second way is only available in web version. On mobile devices, you should follow the first way to update/edit your profile avatar. Your image will be automatically resized to a specified value to correspond to the image allowed size. After setting a profile icon, you can update it again or reset it to the default one by clicking on and then clickig on one of the buttons that appear . Organization Where you have worked. Job Title The job position. Job Details Brief description of your job. Skills Used Skills for your job. Start Date The start date of your work. End Date The end date of your work. Still in this position Indicates that you are currently at the described position. The information entered in the Skill Used field will be retrieved when you search for contacts. From the drop-down menu of your display name, select My Activities. You will be redirected to your own activity stream page. 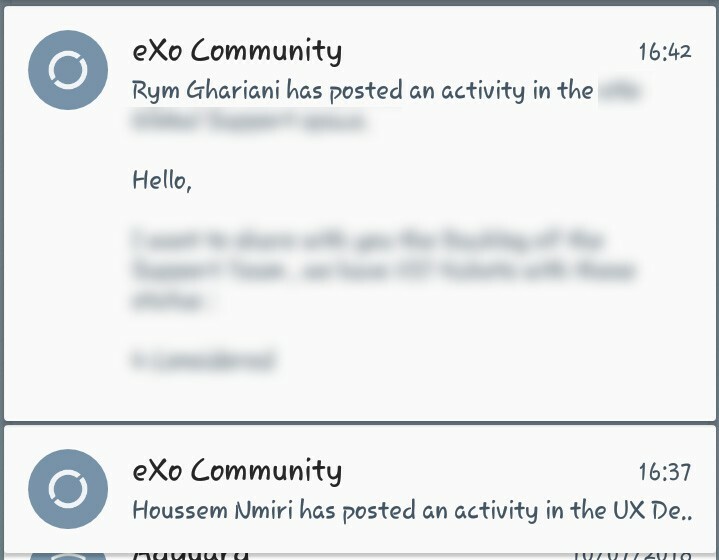 Here, you can see your activities (inside and outside a space) and activities where you were mentioned, liked or left comments. The activities in My Activities are similar to those in My Activities of the Social Intranet homepage. to anyone even if they are not your connections. 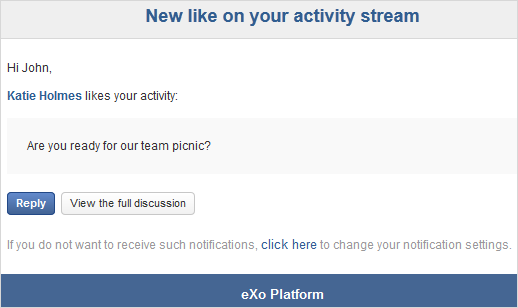 They can comment or like on your activity stream page. However, only your connections can see the Activity Composer that enables them to post on your stream. Building connections between you and other users in the system is very important. It will not only help you follow their activities on the activity stream, but also improve your communication and collaboration. To build your connections, you first need to click your display name on the top navigation bar and select My Connections from the drop-down menu. 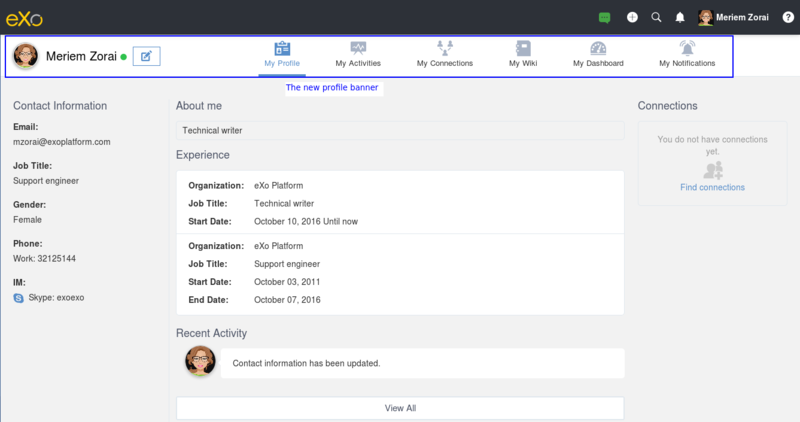 The My Connections page appears. If there are so many connections, the Show More bar will appear at the page bottom. Click Show More to see more connections. Everyone: lists users who have registered in the eXo Platform system. My Connections: lists users who have established connections with you. You can remove these connections by clicking Remove Connection. The suspended users will not be listed in the Everyone and My Connections applications. Requests Received: lists users who have sent you connection request. You can click Confirm to accept being as his/her contact or Ignore to refuse. Requests Pending: lists users to whom you have sent connection requests. You can also click Cancel Request to revoke your request. You can also view your connections by clicking People on the left pane to open the People Directory page which lists all users registered in the portal. 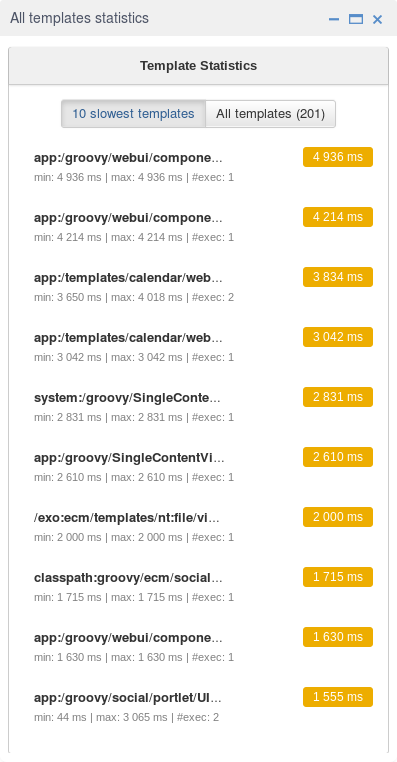 However, when the number of users in the network is bigger and bigger, you should select the relevant tabs (My Connections, Requests Received, and Requests Pending) to do actions more quickly and conveniently. To view all information of a contact, simply click his/her name. You will be redirected to his/her profile page. 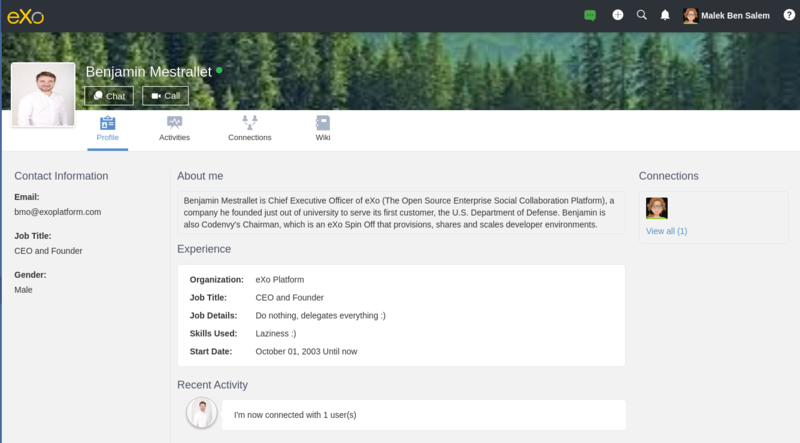 You can also see his/her recent activities, connections, Wiki pages, connection status with you and current status. To see all his/her activities, click Activities on the navigation bar. To see all his/her connections, click Connections on the navigation bar. To see his/her Wiki pages, click Wiki on the navigation bar. However, you can only access this Wiki if it has been made public by the owner or when you are granted as an administrator. To return his/her profile page, click Profile on the navigation bar. Regardless of being an administrator, you do not have right to edit profiles of other contacts. Clicking on that button sends him a connection request, and the button changes to Cancel request. After specifying your desired contact, you can send a connection request via one of two ways. Click Connect under the contact name to send your connection request, or hover your cursor over the contact name and click Connect button. 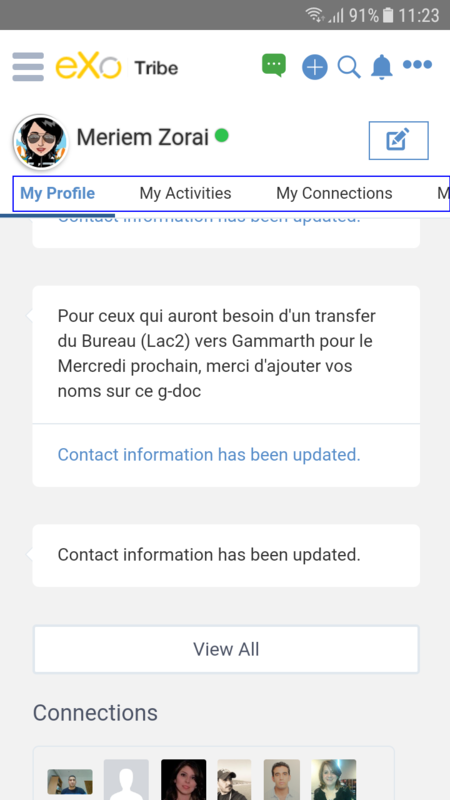 Access the profile page of the contact to whom you want to send a connection request, then click Connect button on their profile banner. The Connect button will become Cancel Request. Select the Requests Pending tab in the My Connections page. Click Cancel Request under the contact name, or hover your cursor over the contact name and click Cancel Request to revoke the connection request. Access the profile page of the contact to whom you sent a connection request, then click Cancel Request. 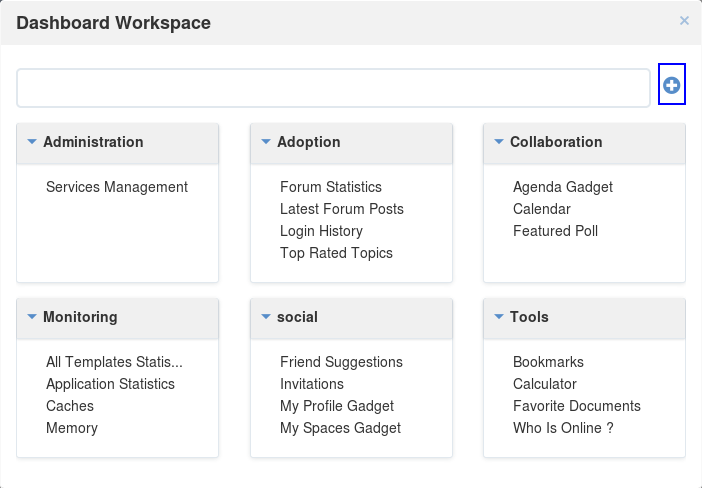 Use the Invitations application on the Social Intranet homepage. See here for more details. Select the Requests Received tab in the My Connections page. Click Confirm/ Ignore under the contact name to accept/deny the request respectively. You can also accept the request by hovering your cursor over the contact name, then click Confirm. To revoke the connection request, click on Deny button. 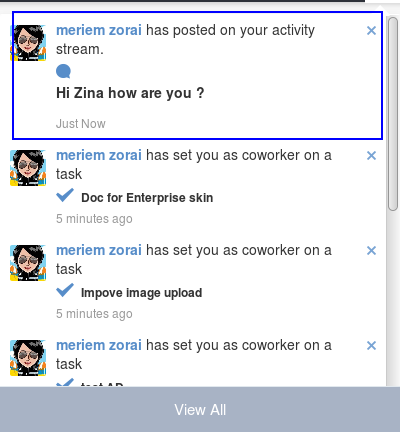 At the first time when you connect to a user in the network, a new activity will be created on the activity stream. This activity always shows the total number of your connections, for example, “I’m now connected with 10 users”. Additionally, a comment which informs that you are connecting with him is added to the activity. 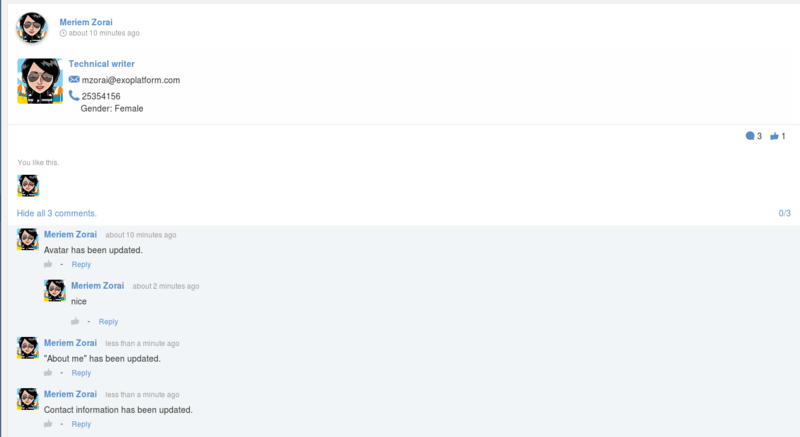 Each of your later connection will also create a new comment added to the activity. If you remove your connection with a user, the number of your connections will be updated to the activity. In the My Connections or Everyone tab, you can remove the connections between you and the users who are your contacts via one of two following ways. Click Remove Connection under the contact name; or hover your cursor over the contact name and click Remove Connection to remove your established connection. Every user has his own wiki where he stores his private Wiki pages or works on drafts before being published on the public Wiki. From the drop-down menu of your display name, select My Wiki to be redirected to your own Wiki page. See the Working With Wikis chapter for the full details. Your wiki page is private by default. This means only you and your administrator can access this via the link (.../wiki/user/[username]). However, if you have made public for your own wiki, anyone can access, read and edit it via the link. This portlet is to host mini-applications known as gadgets. The dashboard uses a variety of graphical effects for displaying, opening and using gadgets. You can open many gadgets with different settings at once. 1- Click your display name on the top navigation bar, then click My Dashboard from the drop-down menu to access the My Dashboard portlet. 2- Click Add Gadgets to open the Dashboard Workspace window which lists all available gadgets. 3- Select a gadget in the Dashboard Workspace window and drag and drop it into the My Dashboard page. 1- Obtain the URL (.xml or .rss) of the gadget you want to add from the gadgets source. For example, *http://bejeweledg.googlecode.com/svn/trunk/bejeweled.xml. Remote gadgets can be only created using an .xml link or RSS URL. However, if you use a link that generates an RSS feed (for example, http://feeds.feedburner.com/gatein), a new RSS reader gadget will be created automatically even if the URL does not end with .rss. 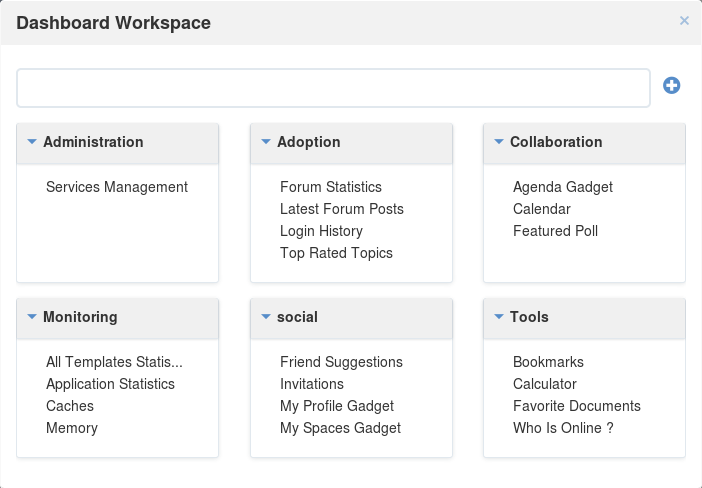 2- Open the Dashboard Workspace window. 3- Paste the URL in Step 1 into the textbox. 4- Click to add the new gadget to the page. This section will introduce you to all built-in gadgets used in eXo Platform via the dashboard. The Login History gadget records users’ login history and provides statistics. 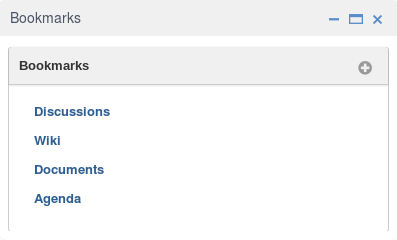 Login History: Lists all of the last sessions opened on the intranet. Statistics: Shows the total number of logins in the graphic format. 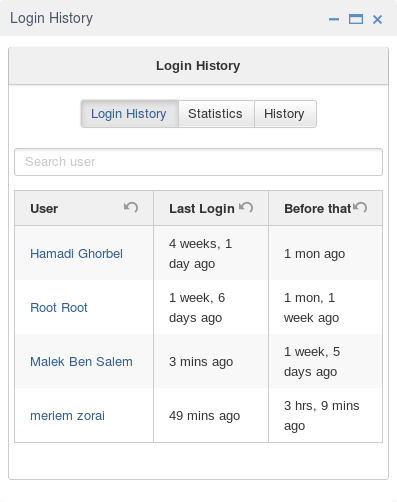 History: Shows all logins of all users by period (Today, Earlier this week, Earlier this month, or Earlier). In the Login History tab, you can look up the login history of a specific user by entering his username in the Search box and press the Enter key. 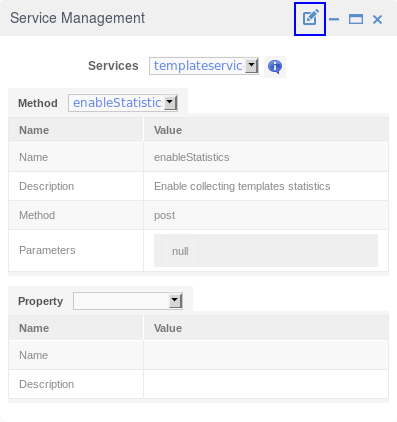 The Template Statistics gadget lists all information related to the execution time of all templates in the portal, therefore administrators and developers will know how fast templates are and which ones should be optimized. 10 Slowest: lists 10 slowest templates in the portal. All: shows the total number of templates and a list of the templates in the portal. The full path of the template when you hover your cursor over its name. The average execution time (in ms) highlighted next to the template name. The time will be highlighted with the yellow color if it is more than 1000 ms and less than 5000 ms. The time will be highlighted with the red color if it is more than 5000 ms.
exec: The number of executions of the template. min: The minimum execution time of the template. max: The maximum execution time of the template. 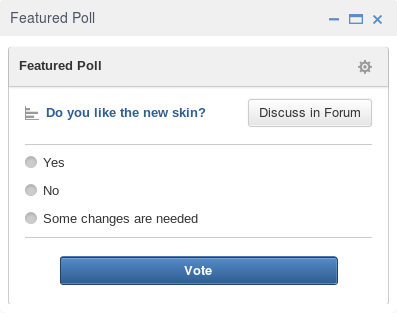 The Featured Poll gadget displays the latest created poll in the Forum that you have permission to vote. You can directly vote and see results on the gadget. This gadget also allows you to discuss about the poll topic in the Forum. Vote for a specific poll: Normally, the latest poll will be displayed on this gadget. However, you can indicate another poll to vote by clicking , then select one from the drop-down list. Tick your selection, then click Vote. 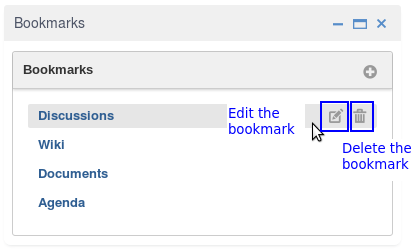 The Bookmarks gadget is a simple link management one which displays your bookmarked links in the portal and allows you to quickly access them by clicking them. You can add, edit or remove any bookmarks. To add a new bookmark, click on the title bar of the gadget. Add the Title and URL into the input text fields, then click Add to accept creating the bookmark. To edit a bookmark, hover your cursor over your desired bookmark, then click corresponding to it. Edit the title and URL and click OK to accept your changes. To delete a bookmark, hover your cursor over your desired bookmark, then click corresponding to it. The Favorite Documents gadget lists all of your documents which are added to favorites, so you can quickly access them. You can go the Favorites folder in the Personal Documents drive by clicking . The Login History and Template Statistics gadgets are for the administrators to manage and improve the portal better. The Edit icon on gadgets only displays if the gadgets have some gadget preferences. This icon enables users to display the Edit form and change preferences of a gadget. The following is an example of changing preferences of the Latest Forum Posts gadget. 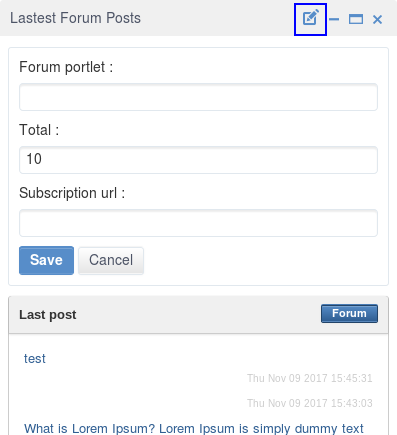 Click to open the Edit form of the Latest Forum Posts gadget. Fill in all the fields of the form. 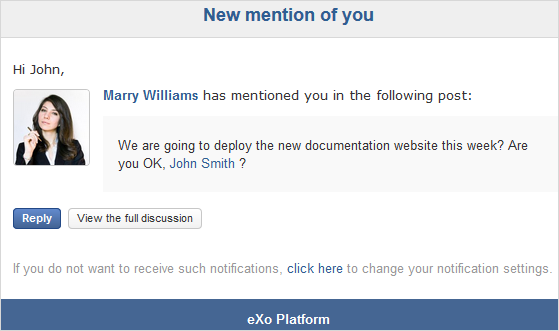 eXo Platform provides you a complete notification function which helps you to avoid missing anything in your organization. 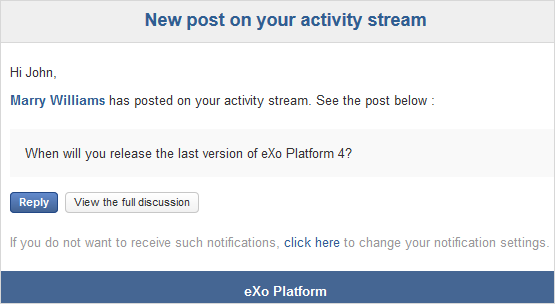 As from eXo Platform 5.1, there are 3 notification types that you can use. By clicking each notification item, you will be redirected to the corresponding activity stream or you can select View All to see all notifications. Besides, the Mark all as read function allows you to change all messages on this menu into the read status. Finally, to remove any notification item, simply click the corresponding . When you are not on the platform web page and you receive On-site notifications, to grab your attention, a number appears in the web browser tab indicating the number of unread notifications. If the platform browser tab is pinned, an indication appears near the favicon to attract your attention about unread notifications. A push notification is a real-time notification that pops up on a mobile device (iOS and Android). It is pushed instantly when the action is done. The push notification displays the same content as the on-site notification. It also displays the eXo Mobile application logo, the site’s name (eXo community for example) and the receipt time. Clicking on it opens directly the concerned activity. By clicking the Watch the video link, you will be redirected to the activity stream where you can play the embedded video. A digest email that collects all notifications during a certain period and is sent once per day or per week. To receive notification and digest emails as well as on-site notifications, your administrator must enable notification plugins first. See Notification administration for details. 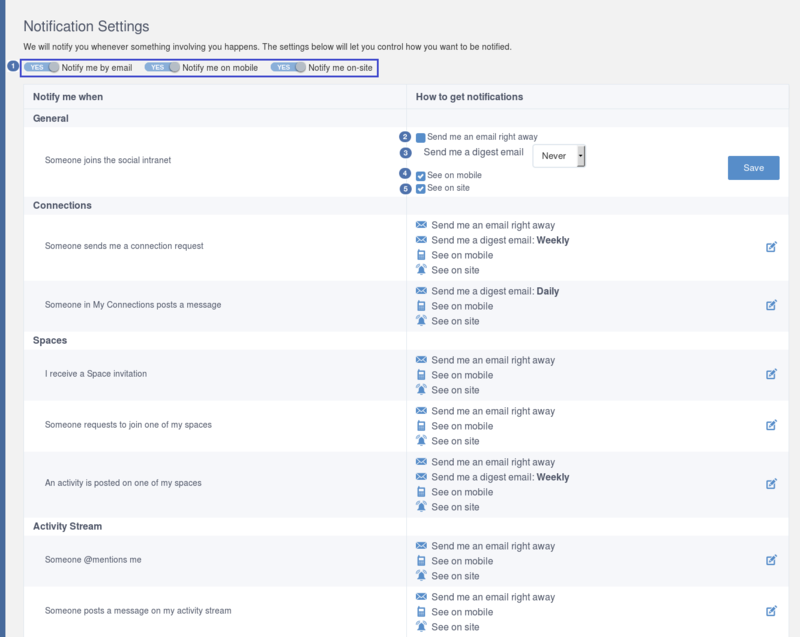 How to choose specific settings for email and on-site notification. 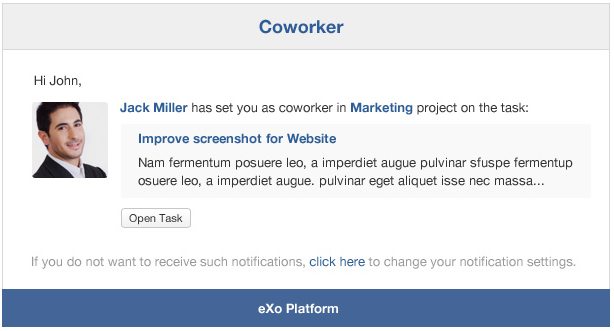 How to manage different notification streams via email and on-site. Describes different actions in the email notifications. 1. Select My Notifications from the drop-down menu of your display name on the top navigation bar. You will be redirected to the Notifications Settings page. The My Tasks settings are available only if the Task Management add-on is installed by the administrator. Notify me by email: If you choose No option, the functions concerning email notification will be hidden. Notify me on-site: If you choose No option, the functions concerning on-site notification will be hidden. Notify me on mobile: If you choose No option, the functions concerning mobile notifications will be hidden. : Send me an email right away: Indicates whether you want to receive email notifications instantly or not. Never: Not include notifications of the selected types in any digest email. Daily: Includes notifications of the selected types in the daily digest email. Weekly: Includes notifications of the selected types in the weekly digest email. : See on mobile: Indicates whether you want to receive push notifications on your mobile or not. : See on site: Indicates whether you want to receive notifications on-site or not. Click Save button to save your new notification settings. Or, click Reset button at the bottom to reset to default values for all your notification settings. You will receive the New user notification when any new user signs up or is added to your network. Click Connect now. You will be taken to her/his profile page where you can cancel your connection request by clicking Revoke. If you wish to connect with this user, click on this notification stream to go to her/his profile page. You will receive the New connection request notification when any user wants to connect with you. Click Accept to approve the connection. You will be taken to the activity stream of your new connection. Click Refuse to deny the connection. You will be taken to the list of received requests. 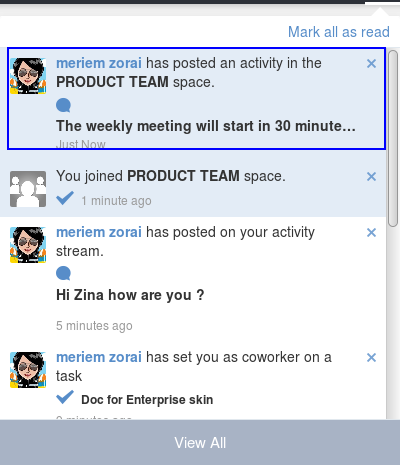 You will receive the New space invitation notification when you are invited to join a space. Click Accept to approve the invitation. You will become a member of the space and be taken to the activity stream of the space. Click Refuse to deny the invitation. You will be taken to the list of all spaces. 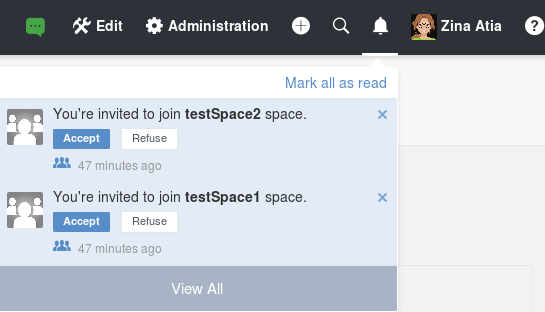 You will receive the New request to join a space notification when someone requests to join a space where you are the manager. Click Validate or Refuse to accept or deny the request respectively. You will be taken to the Members tab of Space Settings of that space. Click Accept or Refuse to accept or deny the request respectively. You will receive the New mention of you notification when someone mentions (@) you in the activity stream. Click Reply. You will be taken to the activity with the comment box that is ready for your reply. If the mention is made in a comment, all comments are expanded and the comment is highlighted. Click View the full discussion. You will be taken to the activity with all comments expanded. If the mention is made in a comment, the comment is highlighted. By clicking on this notification stream, you will be redirected to the full discussion. You will receive the New comment on your activity notification when someone comments on your activity or any activity where you have already commented or liked. Click Reply. 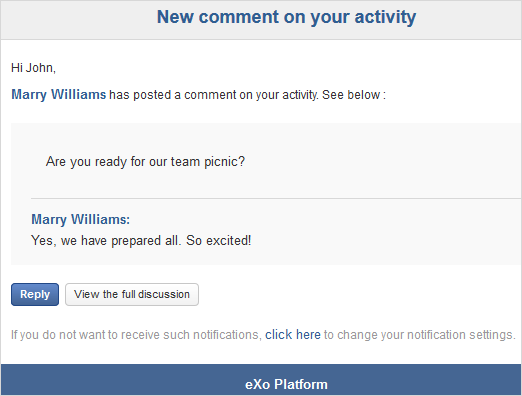 You will be taken to the activity with all comments expanded and the comment box opened that is ready for your reply. The comment of this notification is highlighted. Click View the full discussion. 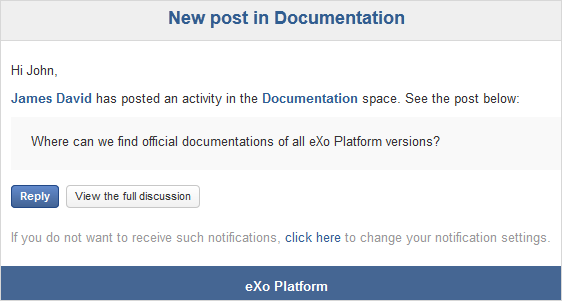 You will be taken to the activity with all comments expanded and the comment of this notification is highlighted. You will receive the New like on your activity stream notification when someone likes your activity. Click Reply. You will be taken to the activity with the comment box opened that is ready for your reply. Click View the full discussion. You will be taken to the activity with all comments expanded. 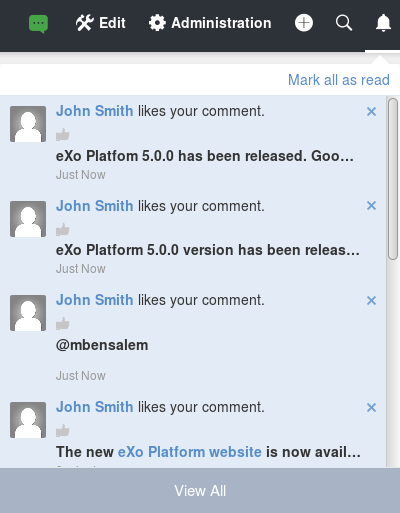 Click on the notification stream, you will be taken to the activity with all comments expanded. 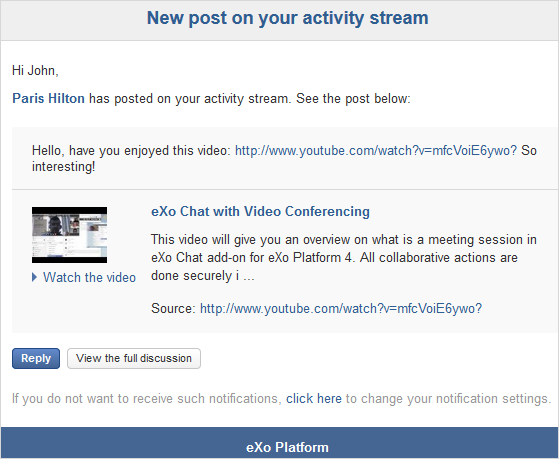 You will receive the New post on your activity stream notification when someone posts on your activity stream. Click on View All on the notification stream, you will be taken to the All Notifications page. 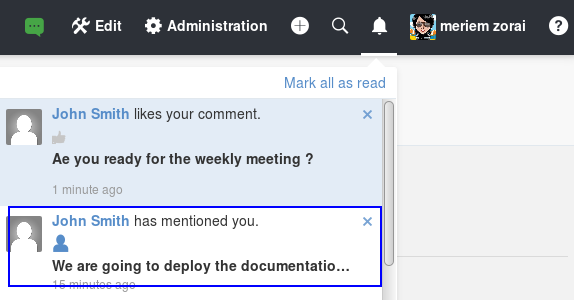 These notifications are available only if the Task Management add-on is installed by your administrator. 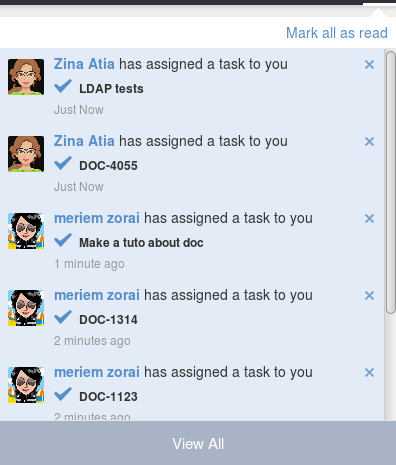 You will receive the Assigned Task notification when someone assigns a task to you. Click Open Task. You will be taken to the detailed task pane in the Task Management application. 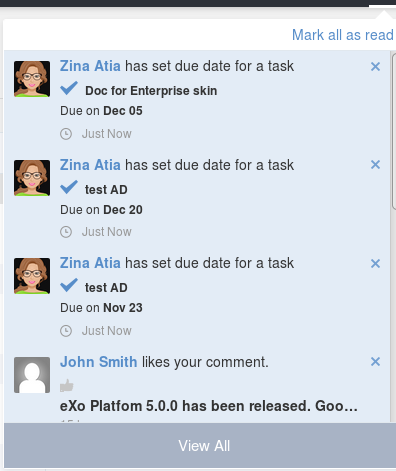 Click on the notification stream, you will be taken to the detailed task pane in the Task Management application. 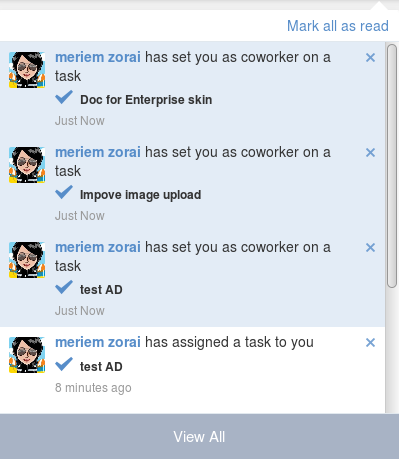 You will receive the Coworker notification when someone adds you as a coworker of a task. 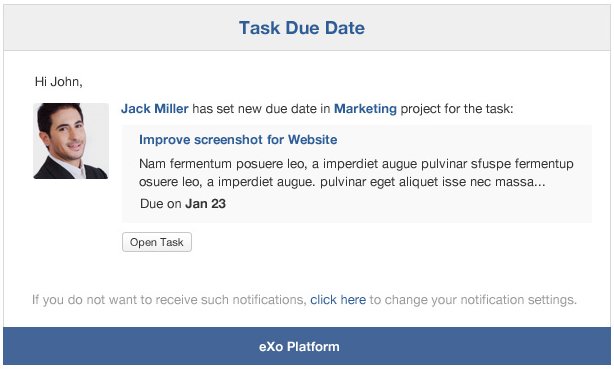 You will receive the Task Due Date notification when someone changes the due date of your tasks. 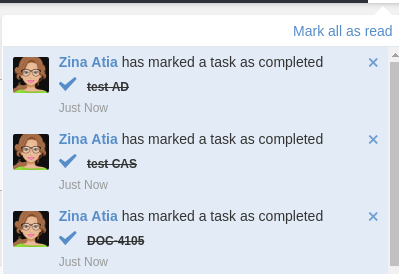 You will receive the Completed Task notification when someone marks your tasks as completed. View the full discussion: Clicking on that button redirects you to the activity that invoked the email sending. 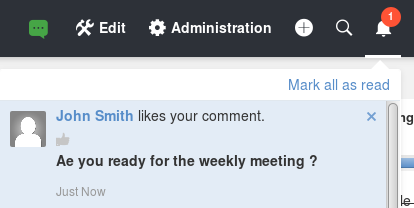 Reply: Clicking on that button redirets you to the activity and lets you directly comment it. Open: Clicking on that button opens the content that generated this activity in its context. This button is available for activities that are related to a content change. More details below. Accept: To accept the space invitation and join the space. Clicking on that button redirects you to the space. Refuse: To decline the invitation. Status updates with file attachment or file sharing: For this kind of notification, Open button opens the file in Documents application. Calendar events: Open action opens the event in the Calendar application. If the event belongs to a space, the space’s calendar is opened. 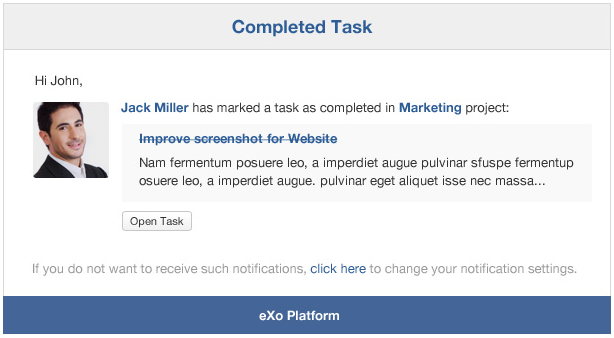 Tasks: Open action opens the task in the Tasks application. Wiki pages: Open action opens the corresponding wiki page in the Wiki application. If the wiki page belongs to a space, the space’s wiki is opened. Forums and Polls: Open action opens the corresponding topic in the Forum application with an anchor set at the corresponding reply. In case of a space discussion, the space’s forum is opened. Answers: Open action opens the corresponding topic in the Answers application with an anchor set at the corresponding question or answer. Web Contents: Open actions opens the content in the Sites Explorer.